Be on-trend with colourful new tram socks! Two different styles: from Australian suppliers Lafitte and my2socks. 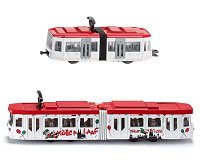 Diecast Melbourne W class tram models in a choice of liveries. Not as big as our Spike the Safety Rhino, but you can take him home with you. The Melbourne Tram Museum has an extensive range of tramway DVDs, books and other tramway items for sale. Visit our shop during open days or purchase via mail order. An assortment of other booklets and tramway souvenirs  including postcards, tie bars and badges  is also available for purchase. For more details on our current stock, send an email to shop@trammuseum.org.au, or call in to the museum on any of our open days. All proceeds from sales go towards supporting the Melbourne Tram Museum @ Hawthorn Depot.